팔색조는 동부 및 남부 아시아 지역, 한국과 일본에 번식하고 있는 작은 새로 몸길이는 18㎝이며 무지개와 같은 7색의 깃털을 가지고 있는 매우 아름다운 새이다. 이마에서 뒷머리까지는 갈색이며, 목 앞은 흰색, 등과 어깨깃은 녹색, 허리·위꼬리 덮깃은 맑은 남빛, 배의 중앙과 아래꼬리 덮깃은 진홍색이다. 꼬리는 흑녹색이고 부리는 검은색, 다리는 황갈색이다. 해안과 섬 또는 내륙의 경사지에 있는 울창한 숲에서 번식하고, 바위틈이나 바위 또는 나무줄기 사이에 둥지를 만들 때가 많다. 먹이는 곤충이나 지렁이를 먹으며, 알 낳을 자리에는 이끼를 깔고 한번에 4∼6개의 알을 낳는다. 울음소리는 ‘호오-잇, 호오-잇’하고, 퉁소와 같은 소리로 운다. 우리나라에서는 황해도, 경기도, 경남, 전남 등지에서 번식하며 봄, 가을 이동시기에는 우리나라 곳곳에서 볼 수 있다. 특히 경남 거제도 학금리와 제주도 한라산 등의 번식지에서는 해마다 여러 쌍이 규칙적으로 찾아와 번식하고 있다. 팔색조는 멸종위기에 있는 진귀한 여름새로 종(種) 자체를 천연기념물로 지정하였고 거제도 학동리의 번식지도 천연기념물로 지정·보호하고 있다. 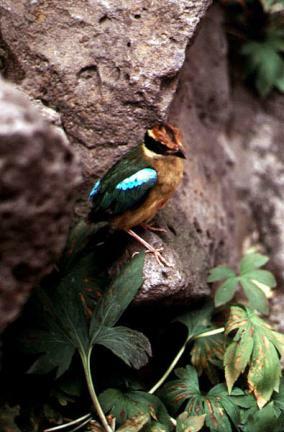 The fairy pitta breeds in the eastern and southern parts of the Asian region, Korea, and Japan. It is a little bird whose entire length is 18cm. The color from the forehead to the back of the head is brown, and the front of the neck is white. The feathers of the back and shoulders are green, and those of the waist and the top tail are clear indigo. The center of the belly and feathers of the bottom tail are deep pink. The tail is black-green, the beak is black, and the legs are yellow-brown. In short, this bird has feathers in the seven colors of a rainbow. 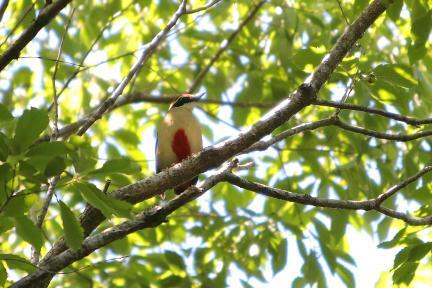 This bird breeds in the wooden forest of the coast, island, and land's slope. It builds a nest on the crack of a rock and between trunks. Its food is insects or worms. It spreads moss where it sits on eggs and lays 4-6 eggs at once. It emits a cry that sounds like “ho-o-it, ho-o-it” and looks like a bamboo flute. It breeds in Hwanghae-do, Gyeonggi-do, Gyeongsangnam-do, Jeollanam-do, and it can be seen during spring and fall in Korea. 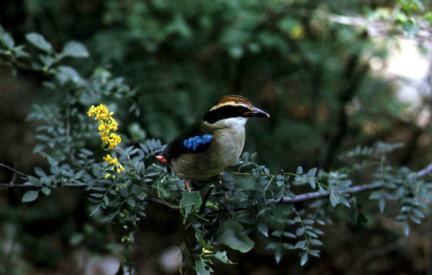 In particular, many couples of fairy pittas annually breed in Hakgeum-ri, Geojedo Island, Gyeongsangnam-do, and Hallasan Mountain, Jeju-do. 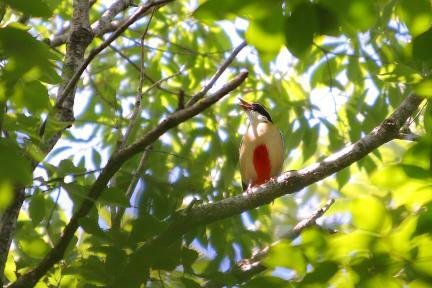 The species itself and the breeding site of Hakdong-ri, Geojedo Island are designated and conserved as a Natural Monument because the fairy pitta is a rare summer bird and is in danger of extinction.